I have been following the progress of Forks Over Knives, a documentary about how your food choices impact your long term experience with the traditional medical community. 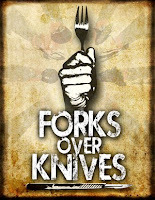 This movie tells the story of what you put in your mouth; the fork and the relationship plant based foods have with your experience with traditional medicine, the knives. My hope is this movie will motivate or continue a serious dialog in families addressing what we want, do we want to watch what we eat and be healthy or is the status quo of taking prescription medicines an acceptable way to grow old. Believe me I understand there are exceptions to every medical rule and some people must take prescription medicines. I honor that these medicines are life saving and improve the quality of life. This message is for people that don’t get the long term ramifications of Forks Over Knives, likely not you but a friend or family member. The movie is complete and showing in some cities. I have not seen it yet and hope it is powerful enough to move the conversation to the next level. 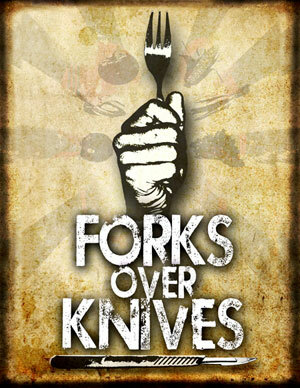 Forks Over Knives will be featured on The Dr. Oz show on Wednesday, April 27. Colin Campbell, Ph.D., Caldwell Esselstyn, M.D., Neal Barnard, M.D., Rip Esselstyn, and Lee Fulkerson appear to discuss the film and its topics.